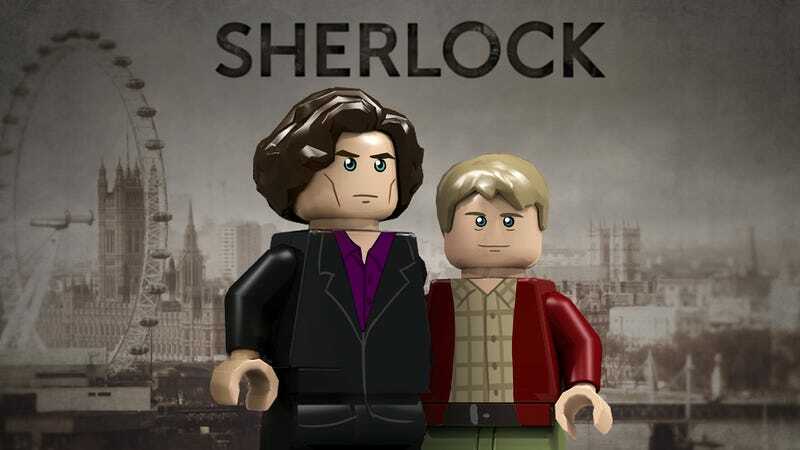 A few weeks ago I told you about Flailx's awesome project looking to get LEGO to consider making a mini building set based on Sherlock - but having come to the attention of the Sherlock fanbase, the pitch has suddenly shot to being the most supported project on CUUSOO! With just over 8,800 supporters, the project needs another 1000 in order to reach the review stage of CUUSOO, where LEGO officially looks into whether they'd create a set based on the idea or not. If the project gains its remaining required supporters, it would be slotted into the review for Winter 2013 as there's a currently a lengthy backlog of supported projects awaiting LEGO's judgement - from a potential Portal set, to a set based on The Legend of Zelda. If you're interesting in backing the project in its final stages, the page can be found here, along with some swanky renders of the potential set (based on 221B Baker Street's living room) as well as some cool Sherlock minifigures - including Lego Lestrade! UPDATE: It's done it! Lego Sherlock has reached 10,000 supporters to become one of the fastest growing CUUSOO Projects in the initiative's history - reaching the coveted 10k mark in just under 4 weeks, and managing to actually bring the CUUSOO site to its knees as it crossed the line! It might be a while before we learn the idea's ultimate fate (there are still projects being reviewed from last year!) in the Winter 2013 review, but nonetheless - we're one little step closer to a glorious Benedict Cumberbrick.